The Highlights: Three Pacific Coast beaches; surfing competitions; world-class walking and hiking trails in the Golden Gate National Recreation Area; a restaurant with great sunset views specializing in ceviche and Peruvian classics. Other Places Nearby: San Francisco’s countless attractions; Half Moon Bay’s specialty shops, galleries, music and craft brewery. Meetings & Event Options: Nearby San Francisco offers numerous venues and facilities. The Half Moon Bay Lodge, about a 20-minute drive south, has 3,600 square feet of meetings space, including two rooms that each seat 40 for a banquet. Less than 15 miles south of San Francisco is an outdoors Shangri-la that few travelers outside California have ever visited or heard about. Sitting next to the Pacific Ocean, Pacifica offers stunning beauty with three beaches, rolling hillsides and world-class walking and hiking trails. The city is blessed with a Mediterranean climate that provides cool summers and warm winters. Don’t be surprised by 70-degree days in February but also be prepared for fog, particularly during the summer. When it’s not foggy, the rugged Pacific coastline—with mountains rising from the shoreline and powerful waves splashing into cliffs—can be mesmerizing. Sitting on a beach or standing on a hillside above, the sunsets are amazing—even more so after a storm. Pacifica’s beaches are not crowded and attract skilled surfers. The city hosts six annual surfing competitions—memorable events to include in an itinerary for a leisure vacation or a group travel event. Linda Mar Beach, a favorite of beginning surfers, is picturesque and the most popular beach.Experienced surfers head to Rockaway Beach and Sharp Park Beach, which have riptides and large swells. Adjacent to Rockaway Beach are restaurants and shops with products of local artisans. Sharp Park Beach has picnic facilities, a walking promenade, nature trails and a 1,140-foot-long pier that’s one of the Bay Area’s best fishing spots. Salmon, striped bass and crabs can be caught from the pier, and no fishing license is required. The Golden Gate National Recreation Area, one of the world’s largest urban national parks, extends about 60 miles along the California coastline and includes Pacifica in its borders. The area, home to more than 700 historic buildings and 60 archeological sites, chronicles more than 200 years of the state’s history: Native American life, the Spanish colonists, the Gold Rush, American forts and San Francisco’s population boom. The Golden Gate National Parks Conservancy provides lots of information about trail choices and closures. 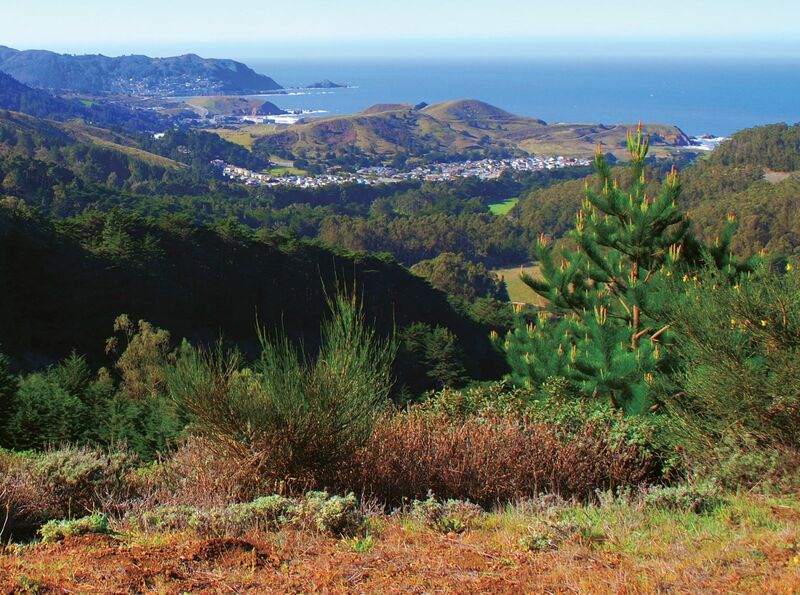 For a first taste of this area and its history, head to Milagra Ridge off Pacifica’s Sharp Park Road. Surrounded by urban development, Milagra Ridge what biologists call an island ecosystem. It houses various threatened and endangered species, including Mission blue and San Bruno elfin butterflies and the California red-legged frog. This trail map may help orient you. Native Ohlone people inhabited this area for thousands of years before Spanish missions of San Francisco de Asis established farms in the area in the late 1700s. In the 1930s, the U.S. Army acquired Milagra Ridge as a site to defend San Francisco Bay. Two decades later during the Cold War, surface-to-air missiles were brought in. They have since been decommissioned, and the area was turned over to Pacifica for outdoors enthusiasts to enjoy. Heading south on the Sweeney Ridge Trail (see trail map) brings walkers and hikers to another magnificent area in Pacifica, Sweeney Ridge. Spanish explorer Juan Gaspar de Portolá discovered this area when he got lost on a mission to settle Monterey in 1769 and found himself atop Sweeney Ridge. He looked out and also discovered San Francisco Bay, which previous seafaring explorers hadn’t found. Four walking trails now lead to the site where de Portolá stood. Sweeney Ridge offers incredible 30-mile, 360-degree views. Among other sights, you can see San Francisco Bay, Sand Francisco’s Twin Peaks, the Marin County headlands and Point Reyes. In the ocean about 25 miles west, look for the Farallon Islands, home to a large elephant seal population that attracts great white sharks. Sweeney Ridge has its own share of wildlife: mountain lions, coyotes, bobcats, gray foxes, rabbits, quail, hawks and shrews.